Eagle Festival – Come celebrate with us in late April as we herald the arrival of the Bald eagles when they pair off and build their nests. Guest lecturers and eagle-inspired art are featured at a time when the eagles are concentrated along the water’s edge and throughout the area. Halibut Hook-up – Book a charter during May openers to catch your limit of the tasty flat fish and snag halibut-inspired art to recall the time spent in Neah Bay. 4th of July – Parade, fishing derby, quilt and fiber arts show – and much more! The day is capped with a spectacular fireworks show that folks come from far and wide to see! Makah Days – weekend closest to the 26 th of August. Three-day event includes a talent show, canoe races, salmon bake, traditional and modern dances Indian gambling games and a fireworks show on Friday night. 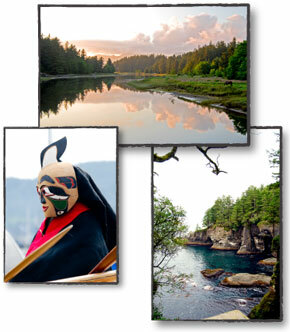 Neah Bay Fest – MORE INFO HERE. Hobuck Hoedown – 1st weekend in October - This is a fun time as either a participant or an observer of surf-kayaking or longboard surf competition in the frothy wake of the Pacific at Hobuck Beach.